Julie can have my home phone number anytime. Just don't ring when Strictly's on. Happy Birthday today to Julie! Happy Birthday, Julie! (Still a Venus fan ). Here's a new colour pic I made of Venus Smith, from the same b/w pic I made the more 'Pop art' version - still on the 'Daub & Blot' website. Quite happy with it, except the velvet curtains look a bit crayony. Anyone know what episode this is from please? Man in the Mirror. The "man" is in the background. Thank you kindly. I can now add the bit of info to the pic on the site. No problem. You're lucky it's one of the few Gale-era episodes I can recognise on sight. I just rewatched "A chorus of frogs" with Venus Smith and I think the scene with the razor is one of the funniest of all episodes. Her evil smile is priceless! Full marks for appropriating that Avengers episode title with Venus Smith. Nice set of screen grabs too. 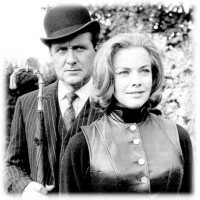 Thank you Dandy - and by the way I like the pictures on your site very much, especially those of Honor Blackman. The one of Honor with the blue waistcoat is terrific. I look forward to seeing more of your stuff, there's always seems to be a twist and a spin to them. A Chorus of Frogs is probably my favorite Venus episode, with School For Traitors and Box of Tricks coming in second and third. The dissolute Avengers site has all Venus's songs and the band numbers to listen to and watch (in the episode 'other' section). It's a great idea to collect things like this from the show together. Many thanks! I'm going to replace all the videos with higher quality MP4 files in the next week or so, so they'll work on ipads, they're currently Flash video. IMDB list two programmes for Julie that are earlier than her TV debut in The Avengers in The Decapod (13th October 1962). The other is for a comedy 'Our House' and an episode from 24th March 1962 (it's one of the 36 missing episodes of this 39 episode series according to lostshows.com). Just wondering if this other IMDB entry is correct.